These great tasty items are grown commercially in Lago Lazaro Cardenas, the large lake on the way up the mountain to Patzcuaro and Morelia. They are commercial grown in pens. 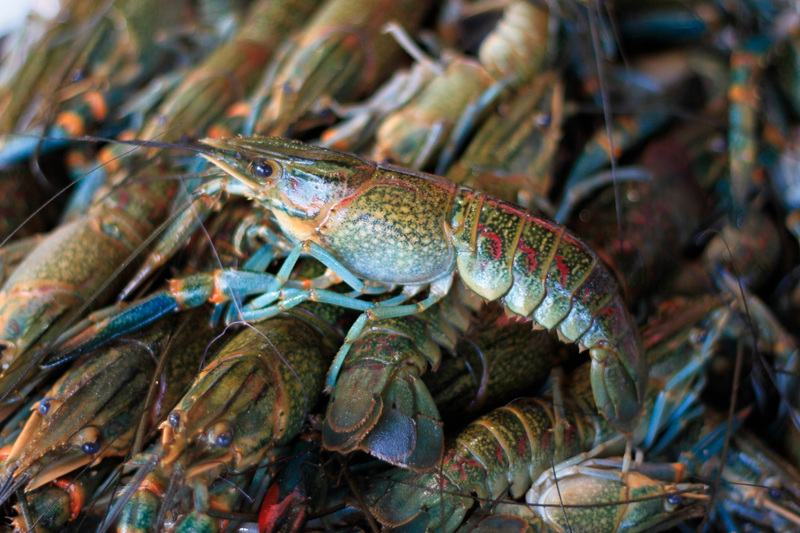 THEY TASTE LIKE LOBSTER OR SHRIMP and are politically correct because they are maricultured. The vendor fills his giant ice chest and drives it down on his moto every day except Monday and Tuesday. He sells them for (this week, there could be seasonal changes) 80p per kilo. If you'd like them cleaned he does that for you at no additional charge. We love them and eat them every couple of weeks. Steam them for 5 minutes or so and it's wonderful! His spot is behind the Mercado on Mangos between Naranjos and Las Palmas. If nothing else, it's fun to watch him trying to keep them from crawling out of the ice chest! It's another taste treat and something that isn't affordable or available in many other locations! Thank you! It is good to know how they are raised. We will have to try them soon. Do you have a picture of them? I have never seen crawfish here. Freshwater shrimp yes, but not crawfish. Already eaten and gone. We have been buying them for several years. What kind of sauce/dip/??? do you use with them. Lemon/butter? Cocktail sauce with horseradish?? Speaking of horseradish, is the fresh ground variety available here? I eat them plain, he dips them in Huichol salsa. I don't know about "political correctness", but salmon raised in pens are also considered mariculture, but should be avoided like the plague. They are dosed with anti-biotics and a chemical to turn their flesh pink. > I don't know about "political correctness", but salmon raised in pens are also considered mariculture, but should be avoided like the plague. They are dosed with anti-biotics and a chemical to turn their flesh pink. Never seen crawdads here. Could they be langostinos? Definitely not. They are crawdads. “on Mangos “. You mean Calle Mangos?